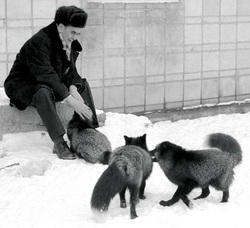 To be referred to breed, each fox had to pass a series of tests, which shows it's response to human presence and contact. After eight months, it is placed into one of four classes. Each class is a different level of tameness, and the better the class, the better the fox's chances of it being labeled 'qualified' for breeding. The first video is a test being conducted to a domesticated fox, and the second is an 'aggressive' fox responding to a human. Class I: The kit evades or bites handler, but may allow itself to be hand-fed. Class III: The kit sometimes wags it's tail and begs for attention when it spots a human. Class IE(Domesticated Elite): The fox sniffs and licks it's handler with honest curiosity before turning even a month old. Q: Which class do you think the first fox in the video would be assigned to? What about the second aggressive fox?